A Gundam series that takes place in primarily a jungle area and emphasizes guerrilla tactics? I’m hesitant to make the comment this show is “Vietnam Gundam” but now as I write this review I wonder if that’s not me being a bit too cautious on my part. Anyways, this is another OVA side story of the One Year War from the original Mobile Suit Gundam. One that asks: Can love bloom on the battlefield? 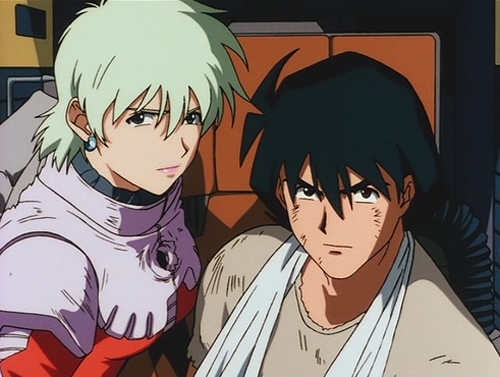 On his way to this new assignment on Earth, pilot Shiro Amada has an encounter with a Zeon pilot named Aina Sahalin. Later on Earth, Shiro becomes the leader of the 08th MS team tasked with suppressing Zeon forces in Southeast Asia. Together with his team, Shiro works to keep his comrades safe and to find a way to make it out of the war alive. Unfortunately, Shiro will see Aina again as she’s the test pilot of the new Zeon mobile armor, the Apsalus, that is being tested in the same area. The series offers a very unique experience compared to other series. It doesn’t empathize the traditional head to head battles with mobile suits crashing into each other type of action that we see in other series. Instead there is a great focus paid on stealth, infiltration, and setting traps for the enemy. One episode showcases the efforts to plan, set, and practice an operation to take out the Apsalus. Once again the Gundam Franchise does its best to dive deeper into how people work through war. The characters also offer a very interesting mix of different individuals with unique motivations. Shiro has a relationship with an enemy pilot, Sanders has survivor’s guilt, and Michel working on keeping his relationship alive with his girl back home. The Romeo and Juliet aspect of Shiro and Aina’s relationship is the real stand out though. The two are very cute together and as the viewer you’ll find yourself rooting for them to make it in the end. They have a rocky road though that they’ll have to experience first. The machines in this series are great entries to the UC Gundam franchise. 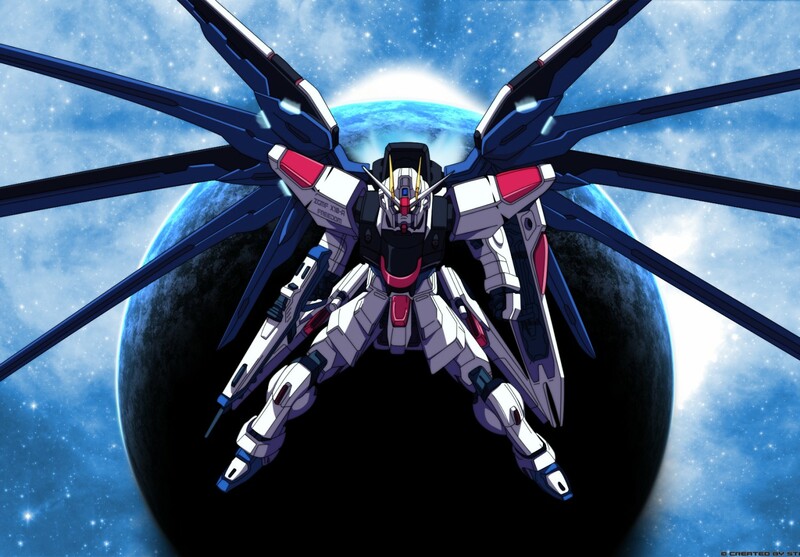 The Apasalus really is one of the better designed mobile armors that exist in Gundam History. If the Zeon has been able to mass produce this machine they would have definitely won the war. Also, I love the EZ-8, even though its a machine that is made out of spare parts I still think its a pretty awesome machine. Especially the way Shiro pilots it. That man really knows how to push a mobile suit to its breaking point. The one aspect of this series that most fans are very familiar with is that it had a hand off mid way through its run. It was originally directed by Takeyuki Kanada between episodes 1-6, but from 7 to the ending it was instead done by Umanoskuke Iida. It does make a person wonder if the Kanada would have finished the series in a different way then what we actually got. It does make a person think. That “What If” aside, this series is still really good. I highly recommend it to any fan of Gundam but also Giant Robots in general. It proves the point that love can indeed bloom on the battlefield. My original intent with the Gundam Franchise was to do some kind of month long celebration. Unfortunately, I find myself out of time and in need of pulling something out of the reserves. So, here it is, my first of many Gundam reviews. Not as elegant as I thought they would be but at least I’m getting them out. Today we will begin by looking at the show that started it all, Mobile Suit Gundam. As people leave Earth to start a new future in space colonies, the Principality of Zeon announces their independence and begins a war with the Earth Federation. As war between these two forces spreads, it soon comes to the peaceful colony of Side 7 which has been secretly developing mobile suits for the Earth. The son of the chief designer, Amuro Ray finds the manual for the new machines. Hopping into the cockpit of a suit called the Gundam he is is able to fight off the invading Zeon forces. Now thrown into war Amuro will find himself having to soldier on with piloting the Gundam to protect the new war ship the White Base and the friends he has on board. Unfortunately he will also have to face the ace pilot of the Zeon Forces, Char Aznable, the red comet. The original series set the themes that would become synonymous with the franchise. Themes such as war is hell, human nature won’t change once we are in space, the enemy is a person too, and intense giant robot combat would echo in the different series that would follow. The enemy is a person too was probably one of the most unique aspects of the show. Before this the enemies in mecha shows were members of evil organizations whose only goals were destruction and mayhem. There are moments where individuals from both sides were shown as being just people who were fighting to survive or to advance but under different circumstances may have been friends with those from the other side. The staples of the franchise would be introduced in this series as well. The cylinder space colonies called sides, the giant robots called mobile suits, and those with mental powers called Newtypes that would be a regular occurrence for the series all originated from this show. The mecha of this series are iconic. The original RX-78 Gundam is such a recognizable part of the Japanese culture that a life sized state of the machine has since been constructed in Japan. 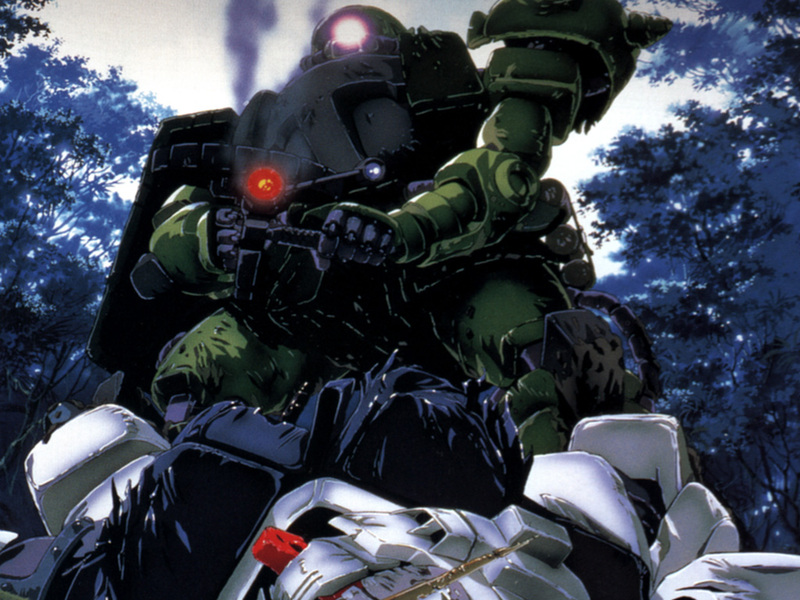 The Zaku-II and various others suits of the Zeon forces had such a unique design that it helped to cause the fans to obtain a close bond with the enemies. Sadly it was the extreme variety that I feel led to the Zeon’s defeat. 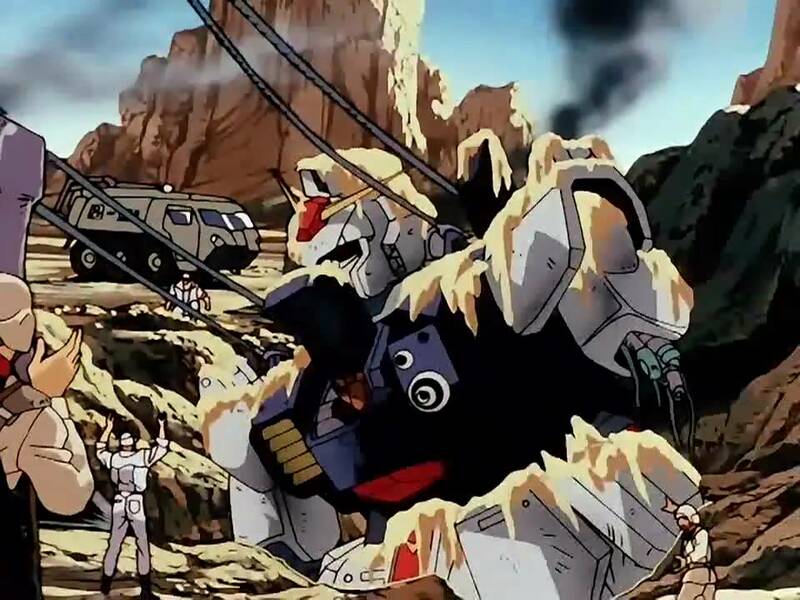 If they had only found a single mobile armor they could have mass produced instead of having so many prototypes that were defeated on their first appearance they may have had a better chance at victory. A fleet of Big Zams would have helped them to win the war. The two main characters of this series, Amuro and Char really are two characters from opposite sides and I don’t just mean which team they are fighting on. Amuro is a man who never wanted to fight but once in the war discovered he was a natural prodigy for combat. Meanwhile Char used war to his advantage to exact his revenge and fight for his own personal agendas. Yet throughout the series the two go toe-to-toe causing their skills and their blossoming abilities as Newtypes to increase exceptionally. Their rivalry and relationship would continue through not only this show but also through Zeta Gundam and Char’s Counteracttack. Despite the influence and impact that this show has made in the anime community its not without its flaws. For starters the show’s animation has not aged well and is hard for some fans to sit through. This makes the series not as easy to approach for those who aren’t used to older animation. Also the series did suffer form cancellation and its ending does wrap up a bit fast. Still, these problems don’t make the show totally unapproachable. And any true Mecha fan should find the time to sit down and watch this classic anime series all the way through. 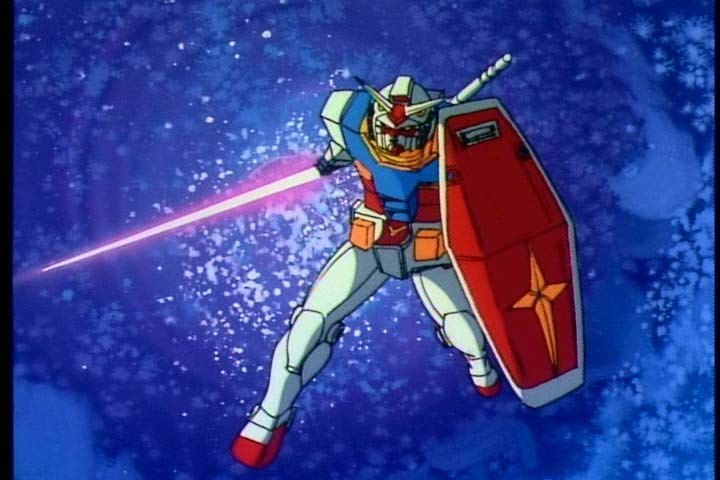 And that’s the original mobile suit Gundam. The show that launched a plethora of sequels and spin offs. Stayed tuned Mecha fans for more. Until then, FLY GUNDAM!! I hope to see some of you there. Don’t be afraid to come up and talk after the panel is over. Reboots are a necessary part of any franchise. 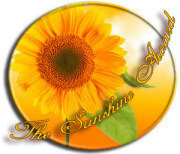 Eventually a new installment must be introduced in an effort to bring new fans to the series. Unfortunately, this doesn’t necessarily mean the show will succeed in capturing the same energy or entertainment of the original or even be a good show at all. In the future, a new element known as Japanium has been discovered leading to a break through in energy production known as Photon Energy. The discover of the element, Dr. Kabuto has worked to create a robot which will be able to utilize the photon energy which is known as Mazinger. Before his death he entrusts the machine to his grandson, Kouji. Now Kouji will have to master the use of the robot to be able to fight against the forces of Baron Ashura who works for the evil Dr. Hell. This show’s biggest problem is how unbalanced it is. The first episode is one of those pre-recap episodes where it flashes ahead to show all the intense action which is going to be coming later down the line in the series. From their, episodes two through six are spent just introducing all of the powers at Mazinger’s disposal. The series then rushes to a final battle in the last three episodes for a final battle with Dr. Hell but introduces a new ultimate villain who isn’t properly defeated in the very last one. The series doesn’t even get a proper ending in the next Mazinger series, Mazinkaizer SKL. It just ends, which is the major flaw it posses. The show also suffers a bit in the characters which are used. On top of reintroducing the characters from the original series the show also introduces characters from original creator Go Nagai’s other series such as Demon Lord Dante, The Abashiri Family, and Violence Jack. The characters are serviceable and help to move the story along but at the same time given the rushed ending to this series and its story telling, it seems like some of them may have been unnecessary. The show was retelling a 92 episode series in 26 (25 if you eliminate the pre-clip show one) episodes, did they really need to add more to it? The mecha are the one memorable aspect of the show. The designs are the same as they were from the original series only updated thanks to the new animation style. The Mazinger truly is a beast of a machine. The series succeeds in expressing just how powerful the robot is and how it is able to go head to head with all of Dr. Hell’s forces. Just wish it didn’t take so long to properly express all of its potential. This series really didn’t hook me or make me become a fan of the Mazinger series. No, I attribute my urge to want to watch more of this franchise to the OVA, Mazinkaiser, which I will get around to writing the review for one of these days. For now this series is currently available to watch on Crunchyroll. Check it out, who knows I may be being too hard on it but considering this was suppose to revitalize a classic series for a new audience, I really think they creators could have taken the time to properly make the corrections needed to make this a great show. As I’ve said before on this blog, there was a time when the idea of Studio BONES producing a mecha series was a guarantee formula for success. A long forgotten age when fan waited on bated breath for the announcement of BONES doing a show featuring giant robots. Today’s anime is one which came during the time when the studio could do no wrong and despite its eccentric nature was still a series worthy of the attention of mecha fans everywhere. A boy named Takuto has transferred to Southern Cross Island in hopes of finding his lost father. While there he becomes entangled in the plot of the Glittering Crux Brigade, who wish to use the mysterious giants known as Cybodies to take over the world. Luckily, the seal of the four maidens prevents the Cybodies from being used anywhere except another dimension known as Zero Time. To prevent the Brigade from breaking the seals and using the Cybodies as they see fit, Takuto pilots his own Cybody named Tauburn to fight and protect his new friends from the dangers surrounding the island. This show is over the top in a great way. From the main character having the nickname of “The Galactic Pretty Boy” to the villains of the “Glittering Crux Brigade” this show pushes the envelope of what is acceptable but you find yourself enjoying every minute of it. The show manages to reach levels of ridiculousness but at the same time retain a level of drama where you find yourself worried for the characters and their circumstances. Each character has a properly flushed out backstory and realistic motivations. Also, almost every one of them has a special power because of being connected to their Cybodies which resulted in a lot of hi-jinks. The robotic designs take a bit to get used to. After all Tauburn looks like a musketeer and he’s suppose to be the robot we root for. Still, the designs eventually grow on you and some of the different “robot of the week” forms which are pulled out are definitely interesting to look at. The show does suffer from a “Monster of the week” format but this is kind of to its advantage. The monster of the week format allows each of the different members of the Glittering Crux Brigade to get a bit of screen time to so they can have their own time the spotlight before Takuto kicks the crap out of their own distinct Cybody. The show does have a few other problems with it. The main being that the series ends far too quickly and doesn’t really have a good epilogue. Frankly, I would have hoped the movie for it would add some new content but I’ve since hear this is not the case. Instead, the show just ends after the final battle without any type of conclusion to how the characters are going to react to what has happened. There wasn’t enough of a need for a second season but a few additional scenes even on the DVD release would have been all the show needed. Is a simple Omake too much to ask? Star Driver was another example of the winning combination of having Studio BONES do a giant robot series. One of these days I’ll have to get around to watching the shows which seemed to break this winning combination. Of course I kind of did one of them already with Captain Earth but I’m beginning to think I gave that one far too much praise then it deserved. If my previous reviews haven’t made it clear I do enjoy the Macross series a lot. Jets transforming into robots and pop songs helping to unite the universe, what’s not to love? Today though we look at a TV series with a lot of new material which takes us far into the future of the Macross universe. The Macross class ship, the Frontier, has come under attack by the Vajira, a race of alien insects. As the young pilot cadet Alto Saotome works to join the private military group, S.M.S. (Strategic Military Services) he attracts the attention of seasoned idol singer Sheryl Nome and the up and coming talent Ranka Lee. The trio find themselves frequently attacked by the Vajira and discover they are much more than simple killing machines. As the truth comes out, it will tie directly into one of their pasts. The series has a lot of good points to it. It succeeds in making sure to advance the universe building aspect of the franchise while making references back to the older shows. References include the Nyan-Nyan restaurant become a franchise, the previous idol songs being played in the background, and even an episode where the characters are cast in a movie based on the events from Macross Zero. This attention to detail really helped to make it feel like it was a proper continuation of the Macross franchise. 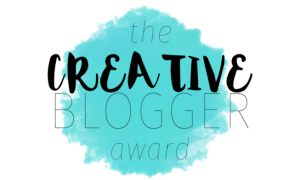 The characters are very entertaining, each with their own deep background about them. Alto comes from a family of Kabuki dancers but became a pilot to fight this upbringing. Sheryl is an idol who is on top of the charts but finds its very lonely up there. Ranka wants nothing more than to sing but has a steep hill in front of her. These three by themselves make the show worth watching but there is still supporting characters like Michel, Klan, and Captain Lee to mention. This show isn’t without its problems. One of the most glaring ones is the episode entitled “Legend of Zero” with the previously mentioned movie filming episode. In it there is a particular action scene which goes so under budget with its animation and it looks absolutely absurd. We are talking Naruto vs. Pain bad but at least its only for like a five minute sequence. Still, you are better than this Macross! Don’t cut the corners, especially when this franchise only gets like two entries every decade. The mecha in this series are the best part. Taking into account what needed to be upgraded, the Valkyries look fantastic especially in CG. Also, they included a close weapon feature which I think all Mecha should have as a back up just in case the enemy gets close. The VJ-25s have some very impressive technology, each with there own special function to combat against the Vajira menace. If you can’t tell they did a great job over all. This is another show which sadly hasn’t made its way to American shores. Again, much like Macross: Do You Remember Love, I strongly plead with anyone who has the power to make it possible for these shows to someday be made available here to do something about it. I’m looking forward to the release of Macross Delta this year but know there is a good chance it won’t stateside anytime soon. Maybe I’ll be proved wrong though and someone will pick it up to stream. The Yushu (Brave) series hasn’t really had much exposure in America. After the Transformers went dormant (at least with Vehicles as their basis), the company behind them, Takara worked with Sunrise to create the Brave series and introduced a series of Super Robot Animes to the world. Unfortunately, the mainstream fans were kind of sick of all robots until Neon Genesis Evangelion came along. This is a shame because there is a lot of great shows during this period which don’t get the attention they deserved because of it. A prime example of this is the King of Brave: Gaogaigar. Mamoru Amami is a young boy who was delivered to Earth by a robotic lion called Galion. Raised as an Earthling, Mamoru’s world is interrupted when an alien presence known as the Zonderians have come to make the inhabitants of Earth their hosts. It is up to Mamoru’s ability to heal those possessed by the Zonders with help from The Cyborg Guy and the organization which supports him, GGG to save the world. When things get out of hand, Guy pilots Galeon and combines with the other the Gao Machines to create the King of Braves: GAOGAIGAR!!!! The good guys of this show really are memorable. Cyborg Guy is the definitive hotblooded, justice will prevail type of mecha pilot. The need for the kid aspect of having Mamoru around actually serves a purpose with how he can heal the humans who were turned into Zonders. The rest of the GGG team lends their own special talents to help save the day and no one character is essential useless because of it. I’d be faulted if I didn’t mention Chairman Taiga, who you look forward to every episode giving the approval for the final fusion which will allow Galion to become Gaogaigar. The villains on the other hand are weird looking and have odd names. The first group of villains has names like Pizza, Penchinon and Polonise. Think that’s weird? Well the second team has characters named after body parts such as Ear, Eye, and Spleen. Despite their very odd sounding names, they are menacing and formidable. Actually its more their plans and the destruction they intent to cause which is truly menacing. The characters themselves, not so much but they trying to transform all of humanity into hosts for their parasitic forces so they set the endgame bar pretty high. The mecha of this series is the real appeal. Gaogaigar itself is an impressive piece of hardware on its own. The base robot Galeon is a mechanical lion who transformers into a robot and has an aura of nobility about him. When combines with the Gao Machines he becomes Gaogaigar, a force which truly dominates the battle field. Gaogaigar is also backed up by some very handy sentient allies. These include the Ninja Volfogg, two sets of twins (HyoRyu, EnRyu, FuRyu, and RaiRyu) and the comical Mic Sounders the 13th. All of these mecha have their own unique skills and abilities and can easily hold their own in a fight. GaoGaigar is a show no one really gave the chance it deserved when it came to America despite the fact it was successfully released. Probably wasn’t added by the fact the show never got a proper run on any major network. If you are a fan of the combining robot genre then you owe it to yourself to track this gem down and understand just how much fun it to had from hearing the approval for the Final Fusion.